Where is it possible to improve, and what’s their impact on your company’s net profit calculation? – See their combined effect on Total Cost, Net Profit and Bank Account Balance. BPM allows for a complete Return-on-Invest analysis. Quickly check any possibilities and options. Let go of the past. Start today and think only about what’s possible to achieve within the next 4 years. Included are an introductory Startup Product Calcultor: a Bakery. You’ll also find Small Business Simulations with 3, 5 and 10 products. 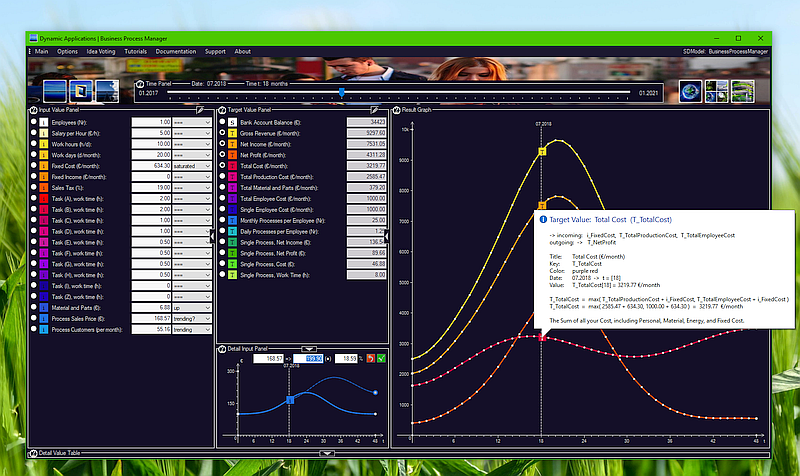 Finally, the Business Process Manager Simulation includes a 10-Task work time optimizer. All Simulation Models are documented inline (ToolTips) and online. Dynamic Applications are gathering no data at all. A traditional Desktop client, all you need. It’s your business. We respect that. Dynamic Applications is a community approach. Customer Driven Development. Two user competitions allow everyone to vote on our best simulation ideas, as well as the platform’s public roadmap. Pay with a Tweet, and define the next big thing we publish. Consult Yourself. Learn how to lead your own company. As long as you’ll be able to identify your best targets to go, you’ll be on your way. OrgCharting OrgCharting helps create professional-looking and data-interactive organizational charts. Easily facilitates strategic planning and workforce management.